If you’re looking for a dependable Toronto pharmacy that cares about you and your health, then stop by one of MEDS Pharmacy’s three locations in High Park, the Junction, and the Kingsway. Did you know that achieving optimal health isn’t as hard as you think? It’s especially easy when you have the resources and support to reach your goals. If weight loss is an issue that you struggle with, MEDS Pharmacy has the answer – the IDEAL PROTEIN Weight Loss Program. It features a medically developed ketogenic weight Loss and weight management protocol. Our pharmacy team has trained coaches that will help you every step of the way to reach your weight loss goals and maintain a healthy lifestyle. We can provide services that will help you with many of the following tips to staying fit. A lot of people find it difficult to avoid eating unhealthy foods, especially when they are so much more convenient and accessible. For many, there’s just not enough time to create healthy meal options, and so often the desire to eat healthy slips through the cracks. But preparing your own food might not be as difficult as you think – and the health benefits are too good to be ignored. Fruits and vegetables are the key to getting the essential vitamins and minerals your body needs to feel healthy. Unfortunately, many people don’t eat enough fruits and veggies, but simply making sure to add these items to your daily meals can dramatically improve your health. Fruits and vegetables are low in sugar, fat, and salt, and are a great source of fibre. Regular fruit and veggie intake can reduce obesity, and lower your blood pressure and cholesterol levels. It’s also highly beneficial to cook your own food and buy your ingredients locally. That way you know exactly where your food is coming from and how it was prepared. Keeping track of your food intake is a great way to manage calories and avoid fatty or salty foods. Dieting and healthy eating can only go so far – exercise is just as important and necessary in order to maintain a healthy way of life. Many people are much too sedentary, whether it’s because of their jobs or because they just can’t find the time to exercise. But exercising doesn’t have to be something “you make time for” – instead, why not try integrating it into your life? For instance, instead of using the elevator, take the stairs instead. Many people underestimate the damage that long-term sun exposure can cause. Sun damage can lead to wrinkles, age spots, and more seriously, a risk of skin cancer. Even if you’re not going to be outside for long periods of times, or if it’s winter, sun exposure is still possible. If you know you’ll be in the sun for a long time use sunscreen with at least 15 SPF. For daily use many moisturizers contain SPF protection so you can protect and moisturize your face at the same time. You may not realize it but your brain needs exercise as well. Whether you’re doing a crossword puzzle in the morning paper or using one of the many brain-game apps available for download to your phone, these games are great ways to keep your brain in shape. Depending on your age and various health factors, how often you should see your physician for regular check-ups will vary. If you’re below 30, don’t smoke or have medical issues, and are not on any prescription medications, then a check-up every 2 to 3 years is fine. Annual physicals don’t actually need to start until you hit 50 years of age. If you are on any medications then seeing your doctor and pharmacist regularly is a good way to keep track of the status of your medication and make sure it’s still working well for you. The amount of people over the age of 60 who take five or more medications at a time is steadily rising. As the amount of your medication intake increases, it’s important to keep track and be aware of potential interactions. At MEDs Pharmacy Group our pharmacists are attentive and able to help you keep track of all your medications. We also offer compliance/blister packaging to remove the hassle of remembering what you’re supposed to take and when. We are a pharmacy that delivers in the Junction and at nearby locations, making it easier for you to get the medications you need on time and without hassle. Smoking is a dangerous habit that will eventually catch up to you. The most effective way to protect your health is to quit smoking. We know that this isn’t easy, which is why our pharmacists would be happy to discuss with you the different products that we have available to help you through the process. While not as bad as smoking, reducing your alcohol intake can reduce your risk of cancer, liver, heart disease, and lower your blood pressure. Many of these health risks don’t appear until later in life, so it’s good to consider reducing your consumption even at a young age – drink lots of water instead. A good night’s rest is an essential part of living a healthy lifestyle. It can improve your mood, cognitive functions, as well as recharge depleted energy. If you’re having trouble sleeping give us a call anytime so that we can advise you on the best products to take to help you sleep. Mental health awareness is growing and the importance of a healthy attitude is becoming even more apparent. With a healthy lifestyle thinking positive will probably come naturally, but you’ll find it even more effective if you practice positive thinking every day. We hope that this list has helped give you some inspiration to attain a healthy lifestyle. Keep in mind that you are not alone and that there are plenty of resources out there to help achieve your goals. 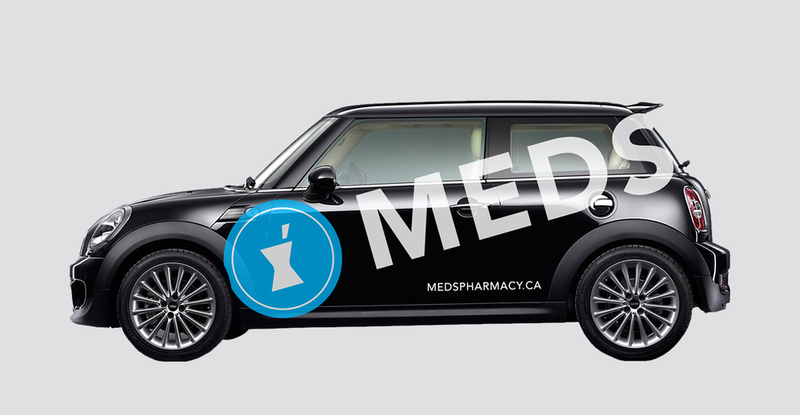 MEDs Pharmacy Group is one of the places you can turn to in Toronto for all of your health-related needs.